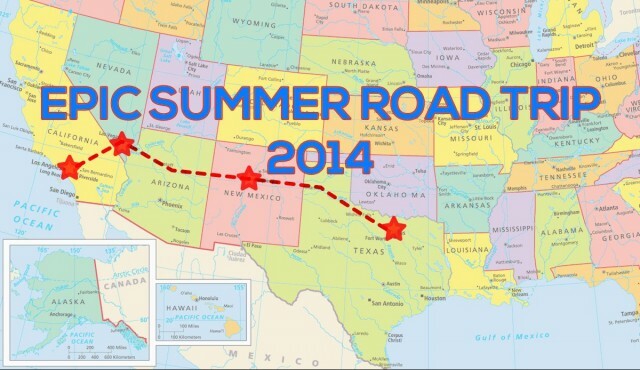 You are here: Home / Family / Epic Summer Road Trip 2014! I’ll let you in on a little secret about me…I’m not a huge fan of flying. Like, at all. Leave Dallas On Thursday June 5th and travel to Albuquerque, NM where we’ll spend the night and visit Tim’s Place on Friday. On Monday or Tuesday we’ll head to Las Angeles, then to Anaheim, CA where will hang out at Disneyland and Calforina Adventure Park for a few days. Depending on how we feel (and if we want to spend more time at Disney) we may visit Santa Barbra before making the trip back to Dallas! We’ve been on road trips before, but this is by far the longest…and the first over five hour one with both our boys! So it should be an experience to say the least! We always love meeting new friends, so if you’re anywhere on our route be sure to leave a comment and let us know…we’d love to meet you in real life if possible! Also if you have any suggestions of things we should see or do while on our trip, or have any advice for parents taking two children on their first ever cross country road trip, please let us know in the comments below as well. Be sure to follow us on Instagram and Facebook to follow along on our Epic Summer Road Trip 2014! Rick — I’m with you– no flying over water for me. I think your road trip map is wonderful and I hope you will continue to share your adventures on the trip. 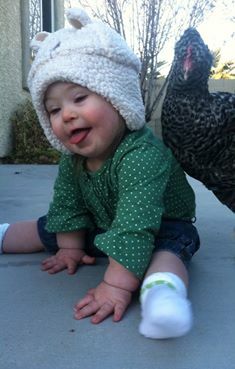 I absolutely love to see all your posts even though I have no one in my family with Downs — I’ve learned a ton from your posts though. I’m 82 and travel days are past but I remember so so many wonderful road trips as a child and as an adult with two children in the back seat — “you’re on my side”, “don’t touch me” , “stop looking out MY window” and so on. Have a great and a safe trip! Thanks for the kind words, and you can bet we will be sharing pictures through out our trip! By the way, you’re only 82……! That’s no where near travel time being “behind” you! Thanks for the kind words, and for sharing the picture. Your daughter is ADORABLE! 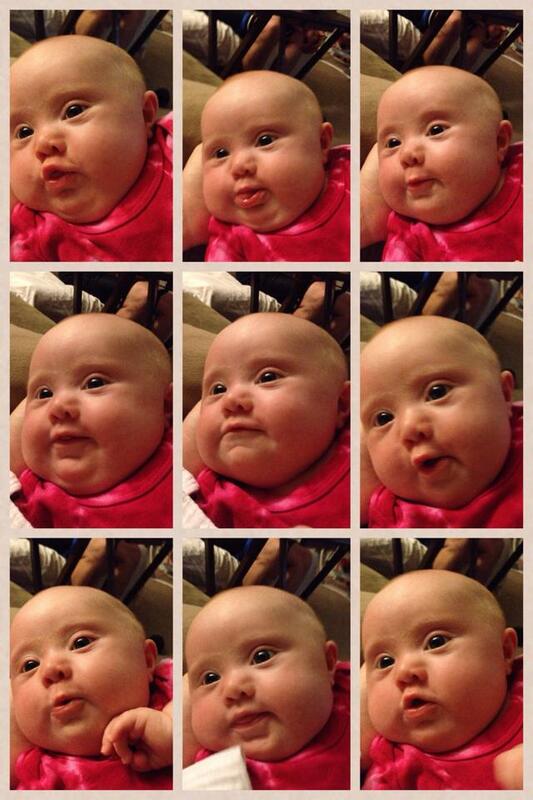 Does she have any siblings? DISNEYLAND I WOULD LOVE TO MEET YOU ALL . Have a great trip my little rockar Noah. Noah wasn’t a huge fan of Disney World when we went there last here…we’re hoping he’ll enjoy it a little more this go around! Do you guys live near by? You should definitely head south from Anaheim to San Diego! It’s only 75 minutes from Anaheim. Noah would LOVE Legoland in Carlsbad, and the San Diego Zoo. Also, Moonligjt Beach is so family friendly with kids! Let me know if you have any questions! Have a great trip! I agree with 100% with Allison… if fact, if it were me, I’d skip the mouse house all together in favor of Legoland and San Diego!! Mouse house is crowded, overly priced, and the lines are ridiculous. Legoland, on the other hand is laid back, almost no lines (because there really aren’t that many ‘rides’ to go on, yes, there are a few things, but mostly open play! There are areas for the kids to just build with Legos, and an amazing miniature Lego ‘world’, with replicas of so many major cities in the US… Vegas included… it’s a MUST see for the adults in your world… but the kids get a kick out of it, too. There is a water splash area that is awesome, just bring swim suits and towels to change into (and water shoes, if desired). There is an enormous fort for running and climbing that Noah would LOVE! There is a great play area for all ages, with a great musical water fountain out in front of it… My point is, it’s very INTERACTIVE…. and literally worth every single penny. Sea World and San Diego Zoo are also amazing! Now, if you are heading up into LA, after Anaheim… there is the LA Zoo in Griffith Park… there is Shane’s Inspiration within the acreage of Griffith Park that is a fully inclusive playground for kids with different abilities, the first of it’s kind ever built. Also, Griffith Park Observatory for star watching in the evenings (check their website for times), all make for a fun day in LA. All down the street from Hollywood Blvd, but that is more an ‘adult’ adventure, not so much for kids… and frankly, no where near as ‘romantic’ as the rest of the world believes it to be. If Disney souvenirs are your goal for Disneyland, you can go to Downtown Disney, and only pay for parking, you can shop or eat at Rainforest Cafe…. there is a huge Disney store with pretty much anything or everything you can find in the park, without having to pay the (over) $100.00 per adult admission, or having to wait the ridiculous times for ride (even with their so-called revamped disabled access system, it’s going to mean wait times that are tough on the easiest of kids.) One other place, if Noah likes fish, is the Long Beach aquarium… I don’t remember the admission fee, but it’s not too bad… it’s a walking tour through two floors of Pacific ocean found fish… and it’s to me, one of the most relaxing places to go… And, lastly, if you happen to decided to come home via Phoenix… hit me up…. we can show you around some cool spots for kids, here, too. I hope you have a great trip… and that all of you enjoy every minute together! Legoland is a must see for you guys. And the San Diego zoo. @Allison – Thanks! San Diego is for sure one of the places we have talked about going. We didn’t know if Legoland was worth the money or not, but it sounds like lots of folks like it so maybe we’ll check it out! Do you guys live near there? We live in Las Vegas & would LOVE to meet you and your awesome family! That would be awesome. Do you guys live near The Strip? We are less than 15 minutes from The Strip. I sent a PM on FB with my cell, so if you & the family would like, just tell me when & where… my girls and I are free all weekend! I’ll put my email in a PM on FB, too. I’m in Anaheim and would love to see the “Noah’s dad” family. We could meet somewhere at Disney, and/or if you want a meal away from the hustle and bustle my family would be happy to have you for dinner. There’s some pretty good home made Mexican cooking that goes on here! Make plenty of time for Cars Land at Disney California Adventure!!! It is absolutely amazing and Noah will enjoy a visit with Lightning McQueen and Mater! The Pixar parade is awesome and the Disney Junior show was a big hit with our little guy! Have a great trip!!! I have done several road trips with small children. Two times we drove from KY to Austin, TX, a 18 hour drive. I have 2 tips. 1. Have a cardboard/fabric box filled with toys. That you can pass them back to the child when they get crabby. When the drop that toy on the floor you have another one ready. It also allows you to pick up the toys while you gas up the car and allows you to carry them into the hotel. 2. Take along his favorite “running/walking” toy. We took a soccer ball for our children to play with. When they are tired of being in the car a 15 minute detour at a rest stop or park can help you make it down the road another 1-2 hours. Hi, we would like very much to meet you all, but we live in Israel. We have two typical sons Amit is 7 years old and Maor is 4.5 years old and Matan a baby with Down syndrome in the age of one year and 4 months. We enjoy very much to read your site and facebook and we learn many new things. You even give us the idea maybe to open a blog or a site too. In Israel the atmosphere is not so tolerant to people with difficulties, like it is in your country. We would like to keep in touch with you. Enjoy and have a good trip! Since you guys love Legos so much, you should head down to Legoland in Carlsbad Beach near San Diego. Beautiful area and could be tons of fun for you boys! Enjoy your road trip, I too enjoy a good road trip. In Summer 1999 took a 7500 mile, 2.5 week trip to NY and back to WA, very memorable trip. Hi, started reading because my grandson Mason has Down Syndrome and my daughter has been following you. I have four children all grown now but remember our most aggressive road trip when I had four under age 6. We hit 4 theme parks in Ohio in 6 days. Key is listen to kids cues and don’t be afraid to adjust. Always have food and drink with you. (When mine were a little older, we got them all their own fanny packs with a juice box and snack. Now they sell the little bottles of water which they didn’t back then.) Easier said then done, but try not let anyone get overtired or over hungry (mom or dad either.). Like others have said stopping for the diversional break and refresh does wonders. When we were in Disney Florida one year, we went back to hotel on property to get out of sun, lay down for nap, or cool off in pool. I know you spend all that money on tickets but it isn’t fun if the kids reach their limit. Better to recharge and go back at night when cooler. Sometimes a picnic under a tree off the beaten path can do the same thing. When every turn is so much new and stimulating, we found doing something routine or ordinary can be reassuring. Plus, they still like and need your focused attention on them. Thanks again for all your wonderful stories and insights. You are making a big difference to many families. Stop and see the Cadillac Ranch in Amarillo! I retired from Delta and family can fly free.None of them will fly. I understand your not liking to fly.I Pray your family has a great and safe vacation.If ever down South would love to meet the little fella that makes my day. Would love to take him to a Lego store and let him just feel his buggy . Hugs and love from Ga.
and they have play spaces if Noah needs to run around and blow off some steam. I grew up in Florida – Disneyland aint got nothing on Disney World and plus both parks are CRAZY expensive and crowded. Would love to meet you guys and get pics with Bradley and Noah! We are 45 mins north of LA and between LA and Santa Barbara! Have an awesome time at Tims Place and Vegas; we are in Vegas from 14th-20th! May god be with you and family as you travel.My family will also be taking a road trip to New Jersey. My son Gerren (30) has DS and will be bowling in the National Special Olympics Games. He will fly with team. (1st flight) and will ride home with us. We are all so excited and proud of him. I wish you full of fun trip!!! Hey Rick, on your way to Vegas stop in Williams and go to Bearazona. It is a smallish drive-through zoo where you can see Dahl Sheep, American Bison, Black Bears, Gray Wolves & White Bison. Then they have an area where you can walk and see a beaver, otters, foxes, bear cubs & a petting area with goats. We live an hour south of there in Prescott Valley. We would love to meet your family and introduce you to Jillian. By the way, we have an annual pass for Bearzona so we can fill up our 12 passenger van & get all of you in for free. 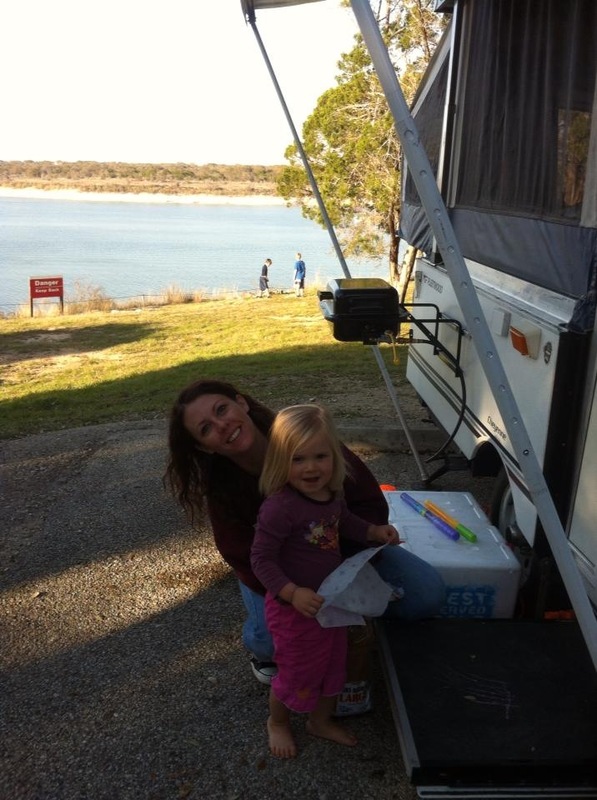 wow have a great time with your beautiful family, its winter in Australia and cold as , i love the summer , so have fun . Just got back from a visit to Temecula Calif. Went to Oceanside, SanDiego. To visit my brother. He is a great tour guide. Enjoy this great adventure with your family. Hi, I would very much like to know if there is a translation of your article, addressed to all doctors on: ” How to deliver a Down Syndrome Diagnosis” an open letter to OB/GYNs into spanish, since it would help us a lot in bringing awareness and educating the medical profession, who do more harm than good when they tell the parents here in Honduras, Central America. This looks like an amazing time! My husband also hates flying…I’m not sure if it’s flying that he doesn’t like or the thought of being stuck on a tarmac for hours on end with other passengers and our kids…two of which are extremely high maintenance! We love them, but OH MY GOODNESS I don’t think even I could handle being stuck with them on a plane for any extended amount of time. Hope you all have fun. That is a beautiful map – we also love road trips. We are in Austin and are headed east this year. Next year – we are going west…same route as you guys. Let me know if you discover any tricks or must sees! Stay healthy!